An innovative new writing system is set to revolutionize the look and feel of putting pen to paper. Parker aims to gain a new generation’s interest in fine writing by creating a one-of-a kind pen that is as beautiful to use as it is to look at. 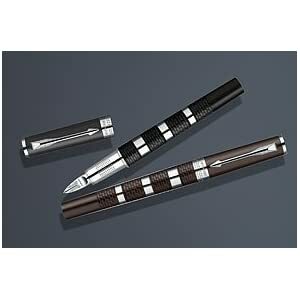 The innovation consists of a cutting-edge refill tip and an engraved metallic hood that, together, constitute the newest technology in pens. TheNerds has been offering a huge selection of Electronics, Computer Hardware, Printers, Housewares & Office Supplies with some of the most aggressive pricing on the Internet since 1997. The Nerds has one of the easiest return policies on the internet. With 100% secure shopping, 350,000 products in stock and a dedicated staff here to assist you, TheNerds is your number one choice. Weekly Deal 1 – Zyxel ES1100-24E Ethernet Switch for only $52.99. Weekly Deal 2 – Zyxel GS1100-16 Ethernet Switch – 16 Port for $78.99. Weekly Deal 3 – Memorex 98499 – BD-R – 4x – 25 GB – 30 Pack Spindle for $33.99. Weekly Deal 4 – Fellowes Powershred MS-450Cs Shredder with Basket for $239.99. Weekly Deal 5 – Epson PowerLite X12 LCD Projector – HDTV for only $464.99. Get $5 Off when you order $50 or more at TheNerds.net by using MOTHERSDAY! This coupon is valid through May 30th. Get $5 Off when you order $50 or more at TheNerds by using Coupon Code MOTHERSDAY This coupon is valid through May 30th.